Storybook charm and quality for the ages make Windy Willows an enchanting addition to your outdoor (or indoor!) decor and a lasting haven for your feathered friends. Copper ridged roof, cypress shingles and rustic scored exterior provide both simplicity and rugged durability in a creation that evokes the wooded wonders of childhood. A classic tree house that you and your birds will love. 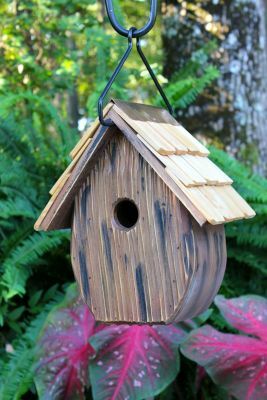 Handcrafted in the USA this bird house has a copper ridged, cypress shingled roof with rustic scored exterior. Made from rot and insect resistant cypress with a 1 3/8" hole. Drainage, Ventilation and Clean Out built in!